Today we took the Saltitude out for its first trip of the season. Today was the shark tournament for wounded warriors and we were ready to get out and get them on some shark action. We had beautiful weather to work with minus the early morning fog, but we made our way out just beyond the 30 fathom line and set out the chum bag. It didn’t take long before we had our first encounter. We ended up with a double header of blue Sharks and the action remained consistent throughout the day. We were fishing in green 65.5 degree water and didn’t have much of a drift, but it didn’t matter because the Sharks were there thick. We ended up catching 21 blue sharks and a dusky shark. The range was from 120-250 pound fish. Tons of fun. No makos, but the excellent action made for a great day on the water. 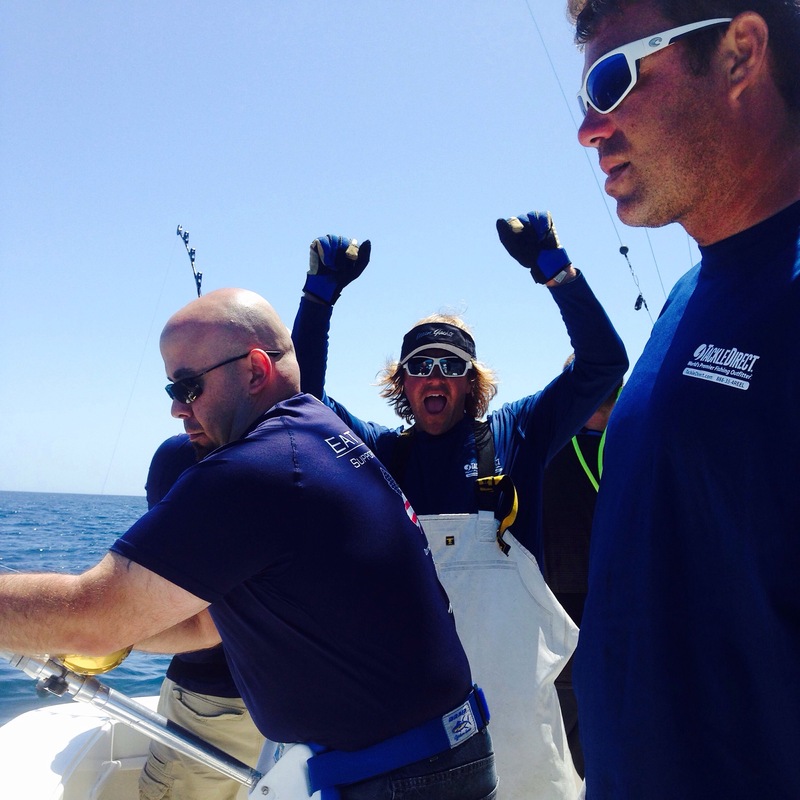 Today we set out to chase a Womens IGFA Line Class Record on 2# test for blue Sharks. Maureen has been chasing this one for awhile. We had calm seas and started out on the 20 fathom line. False albacore were popping up everywhere on the surface but after two drifts we had no shark encounters. The calm weather was making our drifts short to almost nonexistent which wasn’t helping matters. We pushed out further to the 750 square and had 65 degree water that was a clean green. We had one small shark swim through the slick then a small blue that we played with for awhile before catching it on a spinning rod to get him to leave our chin back alone. Then the right one swam up the slick. Mo got the shark to eat her Boston mackerel and game on. The blue was cooperative and Cullen grabbed the wire and held on tight until I could sink the gaff into it. Success!! We got the fish in the boat and ran for the scales. 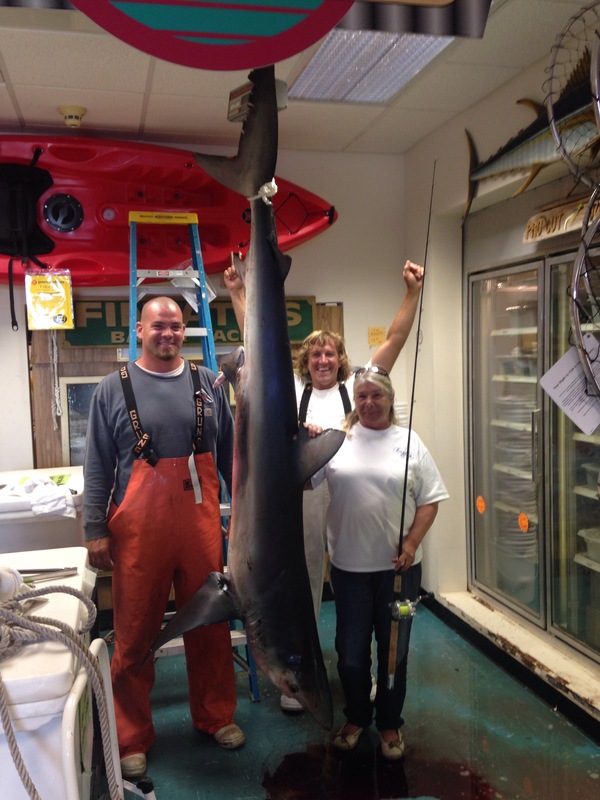 The blue shark weighed in at 148.6 pounds which shatters the existing record that is holding up at 108. For my second episode of 2015 I decided to do a video that brushes over a few of the many things we have to do to get the 54′ Bertram “Over Under” ready for the the Bahamas Season. A lot of people don’t realize how much work goes into getting a sportfishing boat up and running as well as keeping the boat in good working order, especially when you are fishing every day. In the end, it is always worth the hustle and bustle of prepping boats. We just got back into the states on Over Under after finishing up our season in Cat Island fishing the Billfish Blast. We had a fun group of guys for the tournament and had plenty of action, but bad luck reigned supreme for us as we lost quite a few billfish that meant the difference between placing in the bottom instead of the top. We ended up going 3/8 on sailfish, 1/1 on whites, and 0/2 on blue marlin. Still had plenty of action with Mahi as well, but just couldn’t get the slob we needed to win that Calcutta. Looking forward to the Billfish Blast next year. Big thanks to Wayne, Auggie, Tommy, and John for fishing with us..
We had a great season with a lot of action. Hard to beat the consistency of the fishing in Cat Island. On the road now headed back home to get into some tuna and shark fishing action. I slipped out this afternoon on the Rebaits, a 54′ Ocean Yacht, to do some Marlin fishing. Early on we got a bite on the left short rigger MoldCraft Wide Range from a blue. I popped out the flat line and we switched the blue off to the bait. 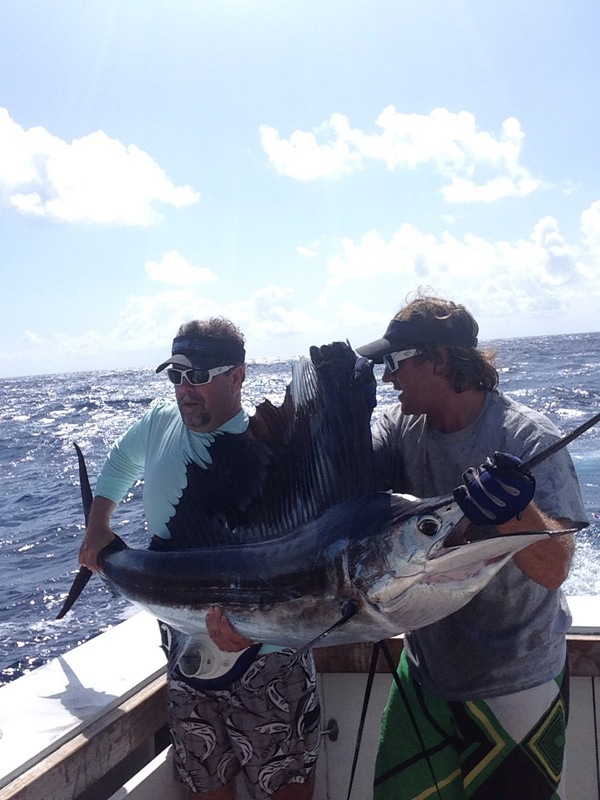 I actually got to fight this one and the fish stayed on top showing us an awesome aerial display for the release. Shortly after we got another blue marlin hooked up on the flat line ballyhoo and this one went ballistic on the surface before getting down and dirty for an hour before we ot the release. Fun afternoon fishing for sure! Today was Day 2 with Robert, Nick, and Chris. We started off right away with a blue marlin and Chris was on for his first billfish ever. Afte a screaming/angry run way off the bow the fish settled down and we got back on top of it. Chris kept it right until he surfaced again and we got the leader for the release and another angry set of jumps right into the side of the boat before we broke him off for the release. Not long after we made our way down to Columbis Point and hooked into a nice sailfish for Roberts first personal sailfish catch. After an awesome series of jumps behind the boat and a quick pictures we got a clean releas on the sail. We picked at a dolphin and had a few tunas eaten by sharks, but we did manage to get a double header of 10-20# yellowfin tunas into the boat, which for Cat Island is an incredible feat! Slack tide was at 11:30 and the bite shutdown then for the remainder of the day for us. Slow afternoon but still a fun day of fishing! 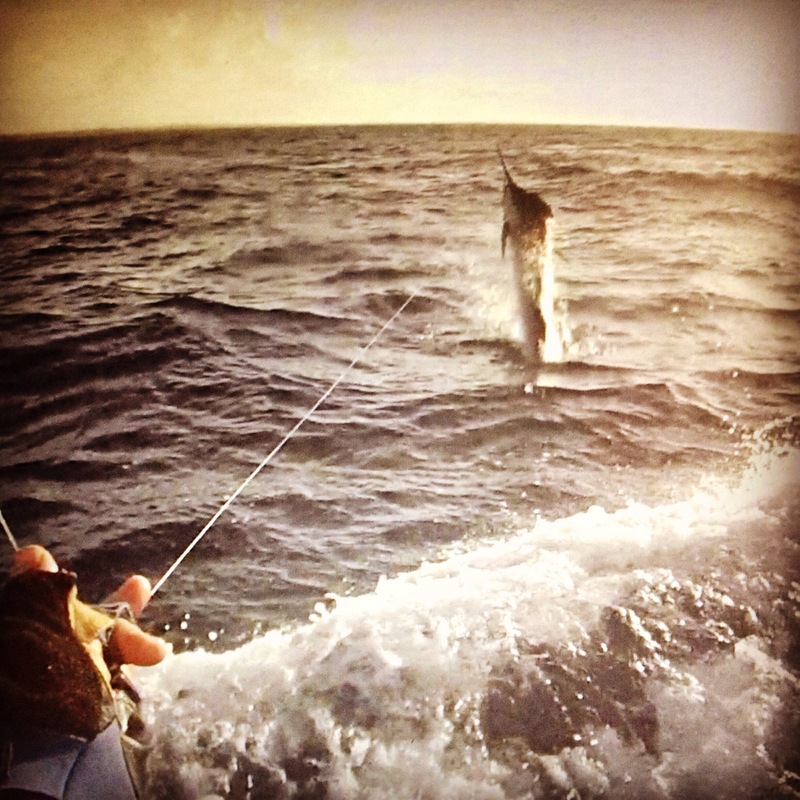 Always awesome catching a blue marlin and sail! Today we started our day with a blue marlin release. We picked at some Mahi along the edge and ended up finishing the day with 7 in the box. We released a white Marlin in the late morning then it was dead from low tide at 11 am until 1. The. We hooked into a blue on the super chugger but jumped him off. Late in the day we had a white come in on the Joe Yee Super Plunger and switched him off to a ballyhoo. We lost him inches from release. Bummed on that on but fun day. At it again tomorrow.